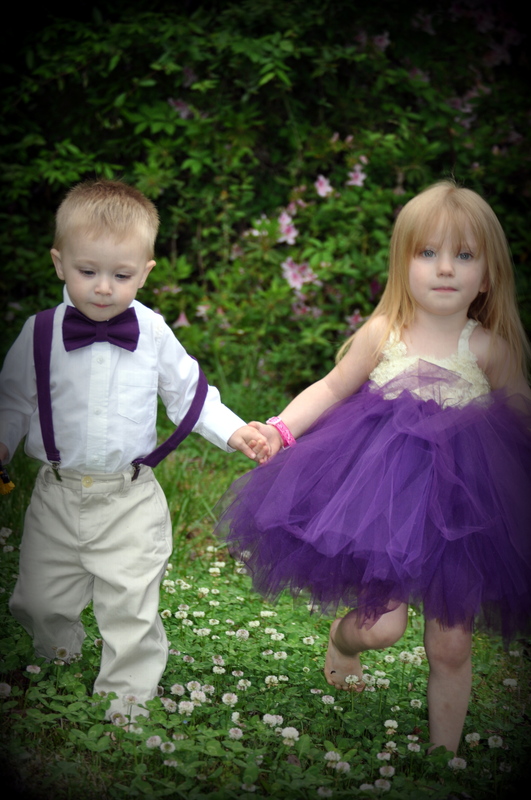 The two older monkeys were in their aunt’s wedding a few weeks ago. Aren’t they adorable? 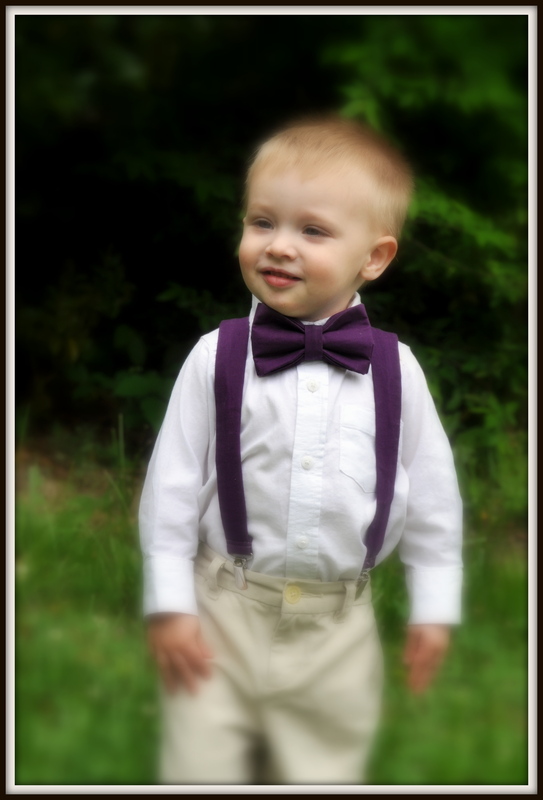 I made the bow tie and suspenders for little man, and wanted to share with you a very easy tutorial for the suspenders. If you aren’t not interested in the tutorial, you can stop reading now. Insert one end of an elastic piece through loop in clip, fold under 1/2″ and stitch in place using a zig zag stitch across the raw edge. Be sure to secure your stitches. Repeat with other piece of elastic and a second clip. Set these two pieces aside. 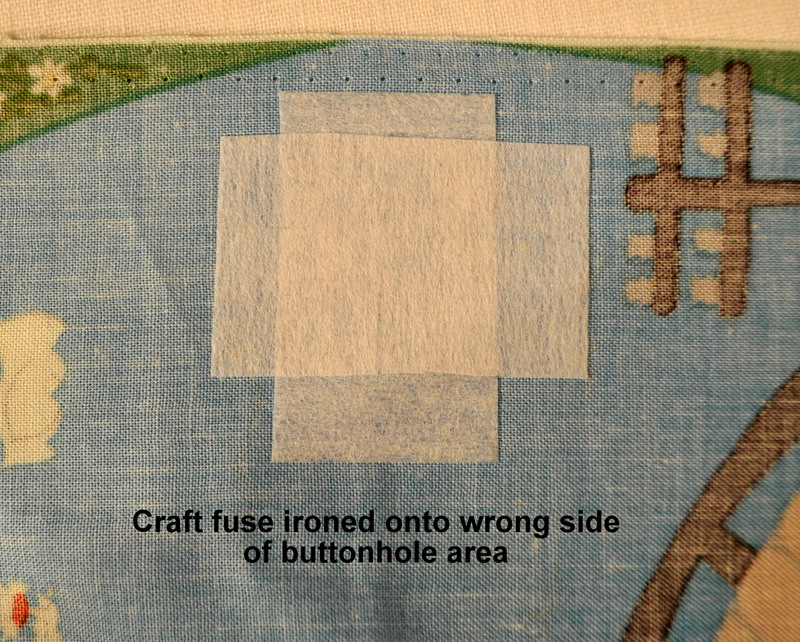 Attach interfacing to wrong side of fabric (I used iron on). 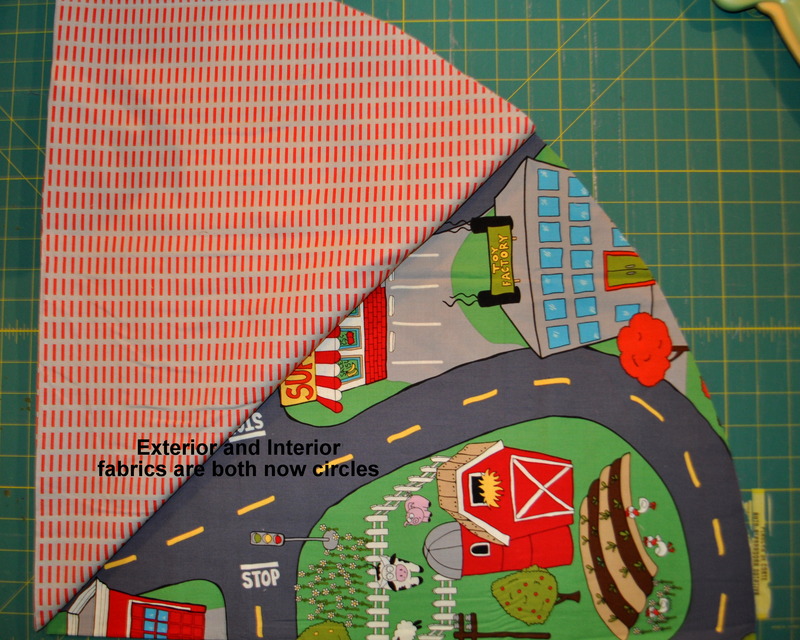 Fold fabric lengthwise with right sides together and then sew down the long side using a scant 1/4″ seam to create a tube with both ends left unsewn. Repeat with other piece of fabric. Turn right side out. 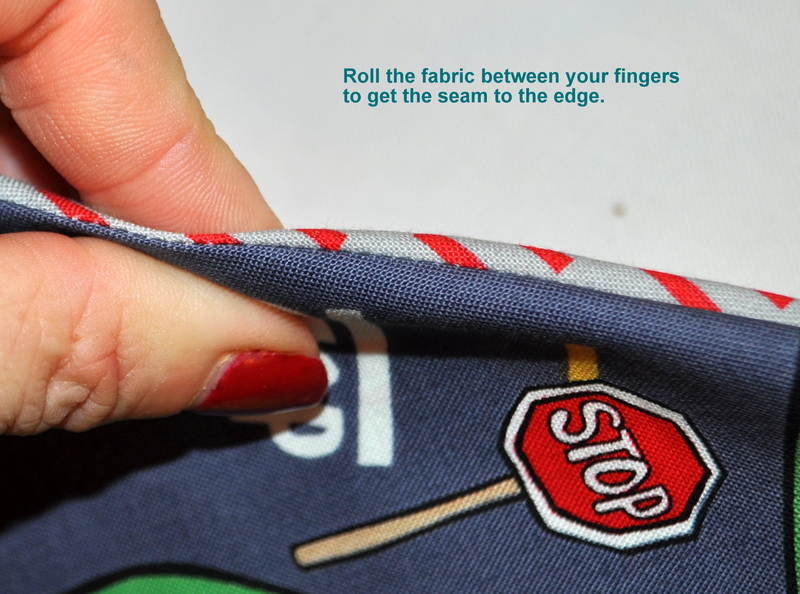 Roll seams between your fingers to move seam to edge. 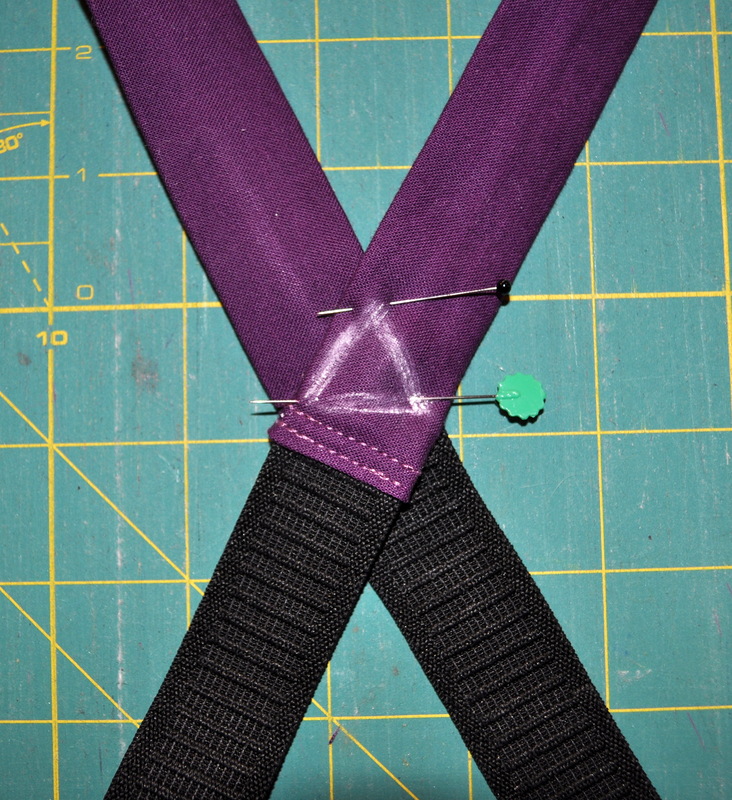 Reposition seam to the middle of the back side of strap and press. 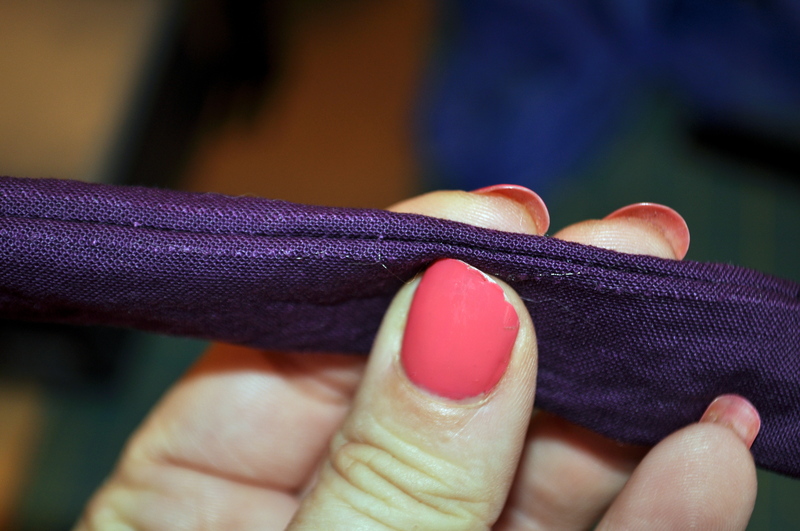 On one end of the fabric strap, fold the raw edge about 1/2″ into the tube to create a finished edge. 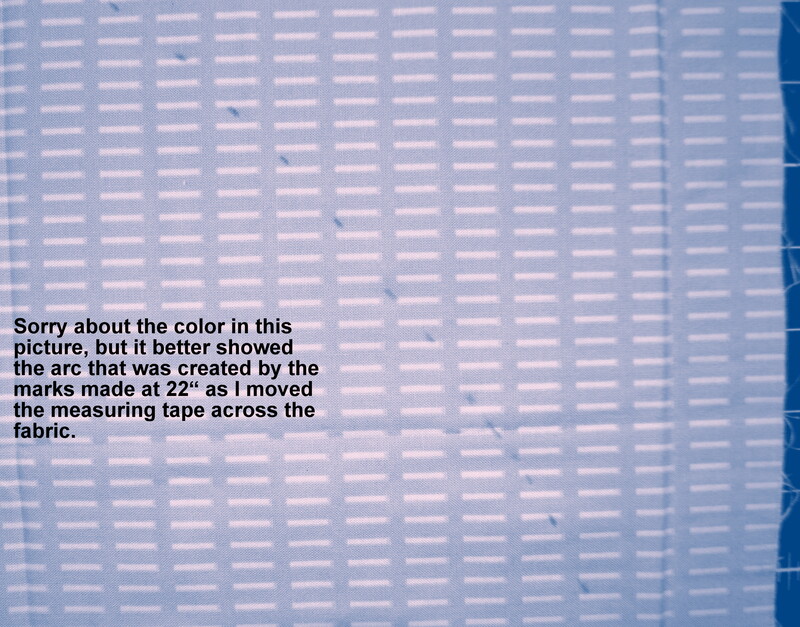 Insert elastic approximately 1/2″ into the tube. Top stitch close to edge to finish off. Repeat with other strap. At this point you have two straps. You just need to figure out how long they should be. Now would be the best time to grab your little man and try them on. Attach the clips to the back of the pants, drape over the opposite shoulder, pull down to the top edge of the front part of the pants, and mark with a pin. Slide on a clip. 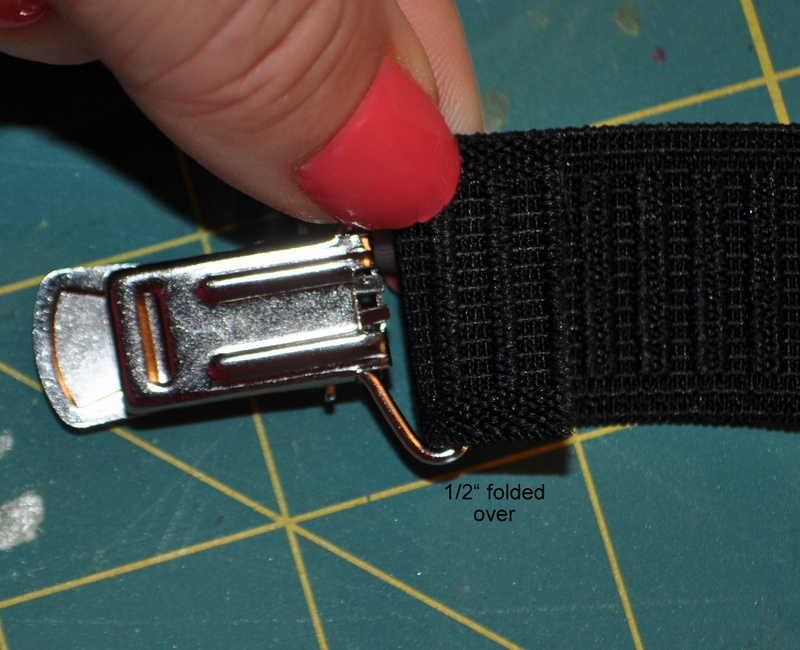 My clip has an approximate 1/2″ area from where the top edge of the pants will be in the clip to where the strap will be attached to the clip, so I actually want my suspenders 1/2″ shorter than what I just measured. 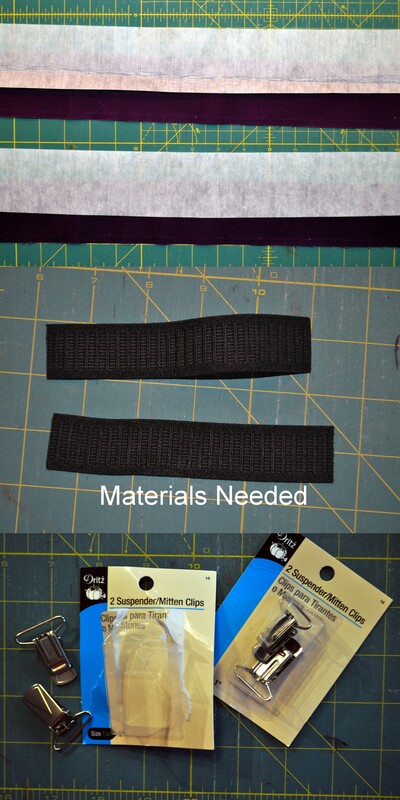 Cut length of strap approximately 1″ from where the strap will be folded when attached to the clip. 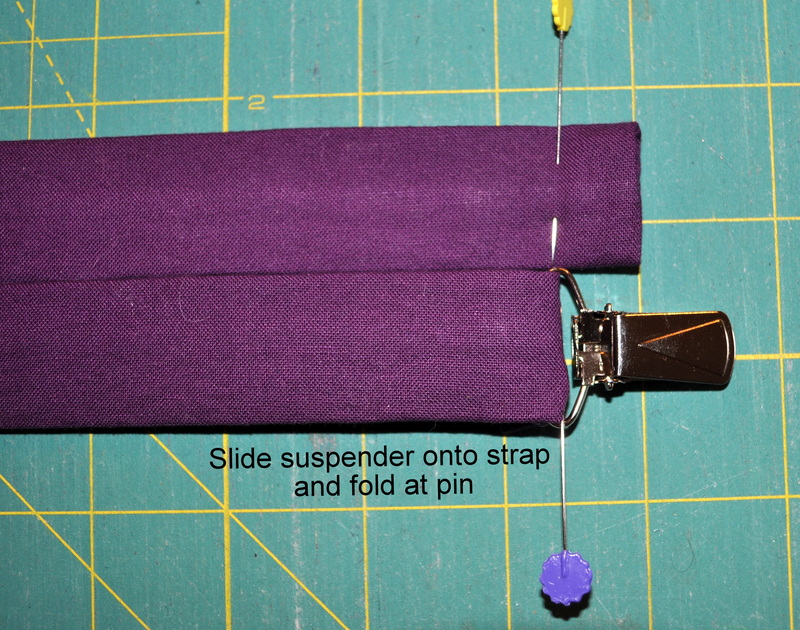 Slide the strap onto the clip, folding under to the back side at the position marked by the pin. 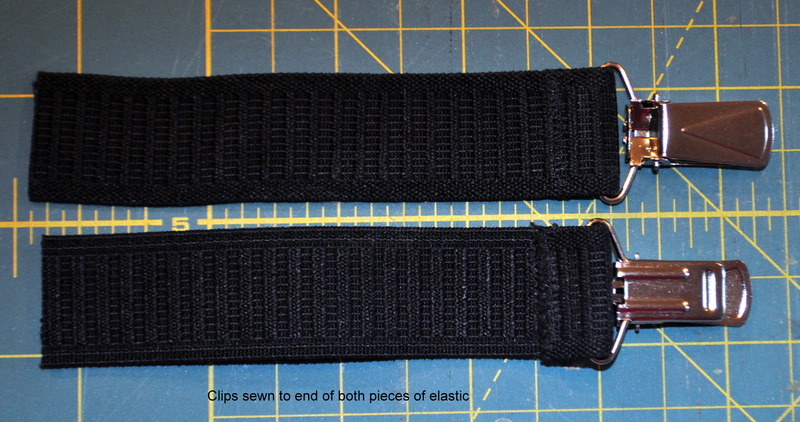 Be sure the strap is lying flat on the table and that the top side of both clips (one on each end) are facing the same way (both facing up). 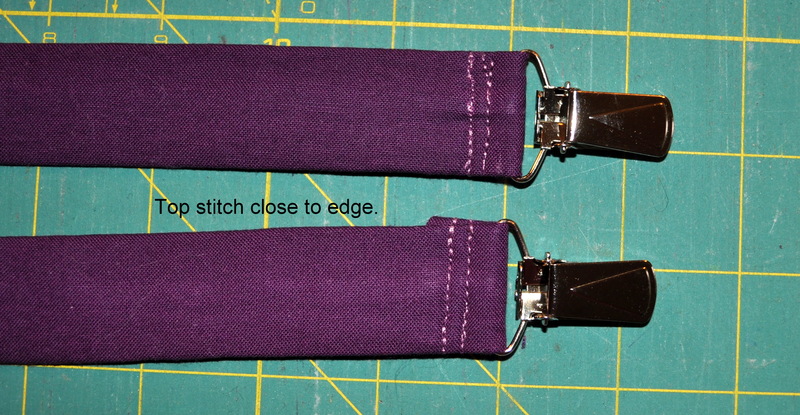 Top stitch close to edge to secure strap to clip. 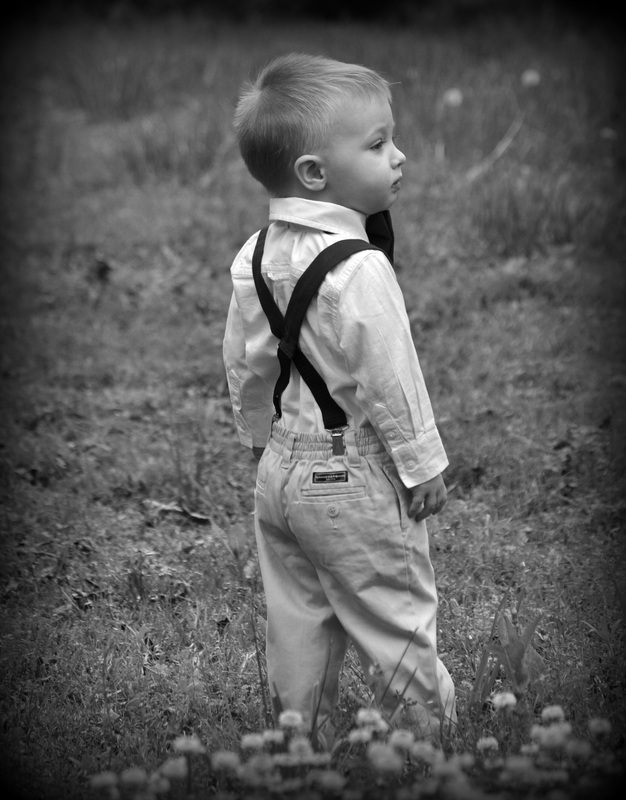 Time to grab your little man and try the suspenders on again. Clip the elastic end to the back side of the pants, drape over the opposite shoulder, pull down to the top edge of the front of the pants and attach with the clips. Pin in place where the straps cross in the back. 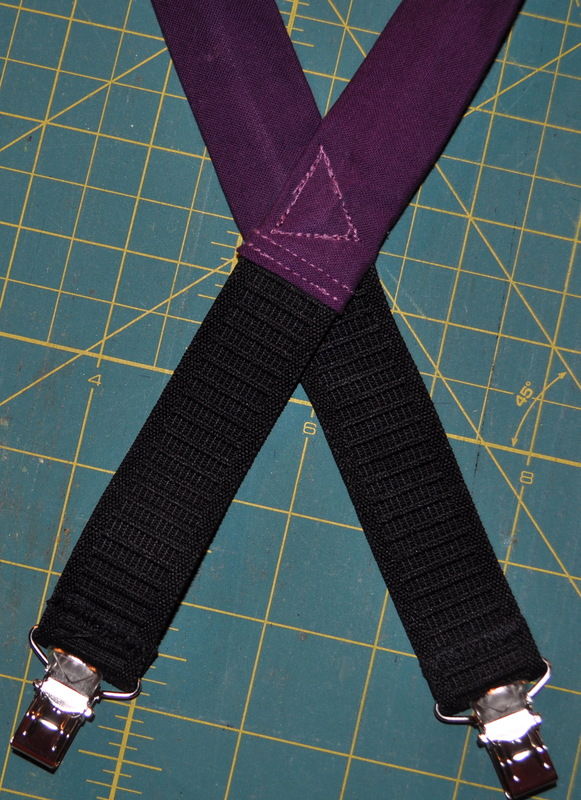 Remove the suspenders and mark a chalk triangle where they need to be sewn together. Topstitch on top of the chalk triangle. Your suspenders are finished. Well done. My grandson turned 2 today. 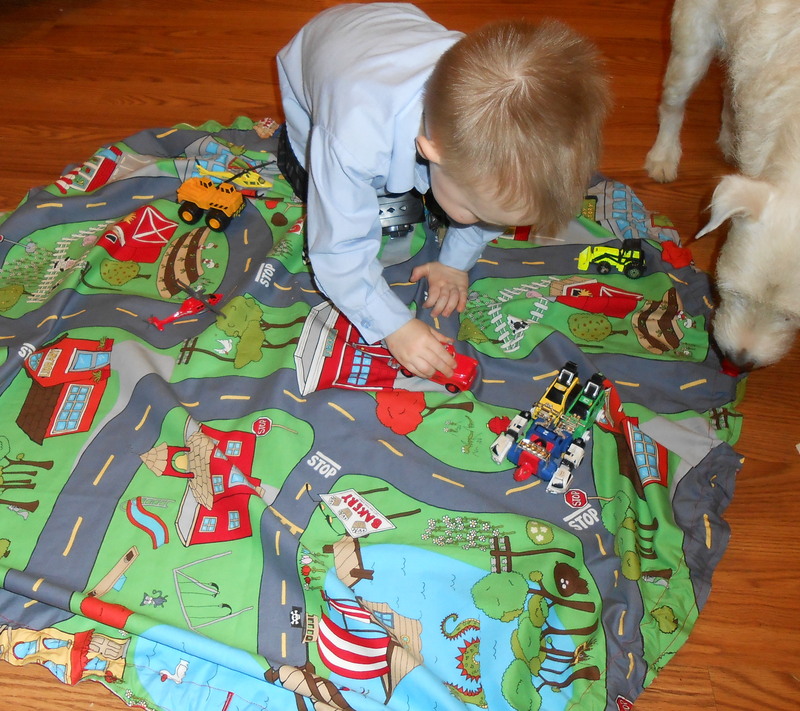 He loves playing with cars and trucks. To him, anything with wheels is a truck — a vacuum cleaner, a bus, a cart. There is no difference. Wheels = truck. Period. I made my nephew a Lego sack in December for Christmas and I thought it would be a great idea for a truck sack as well. 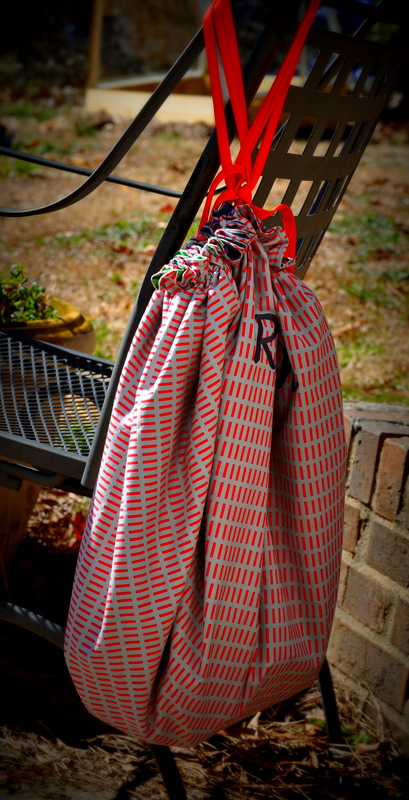 All you need is somewhat different fabric, and you have a cool sack for things with wheels. Most fabric is 42”-44” wide. 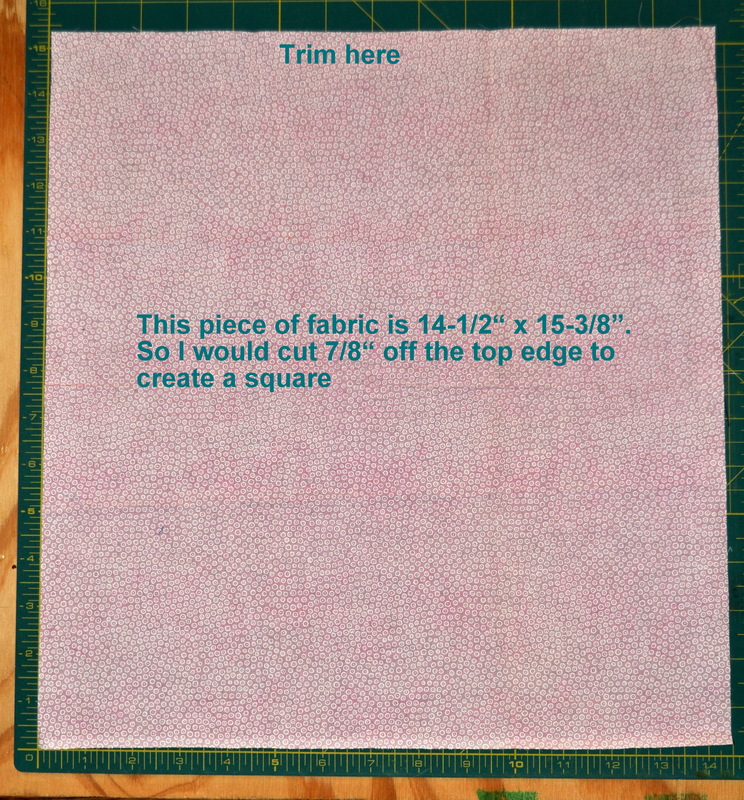 You will want to start by cutting the length of your fabric to be the same as the width of the fabric. So, if your fabric is 44” wide, the length should also be 44” so that you have a square. There are a couple of ways you could do this as pictured below. 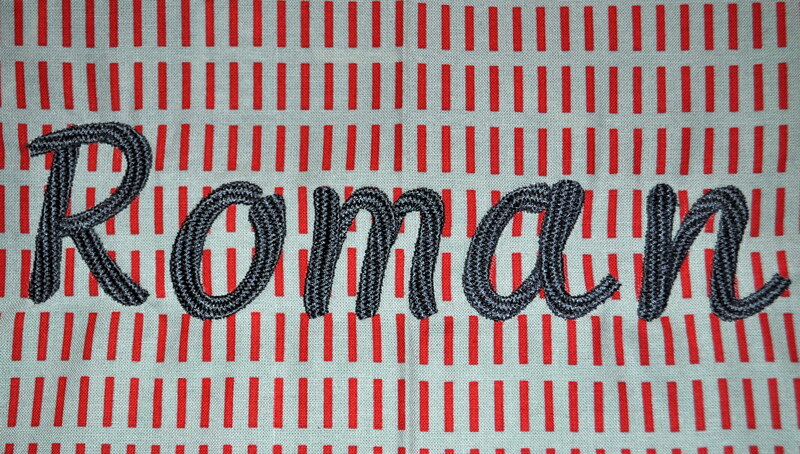 This is a small sample of fabric I am using just for demonstration. This does not need to be perfect, close will work. Once you have your fabric length and width the same size, fold the interior fabric in half, and then in half again, such that a square is formed. Then do the same for the exterior fabric. 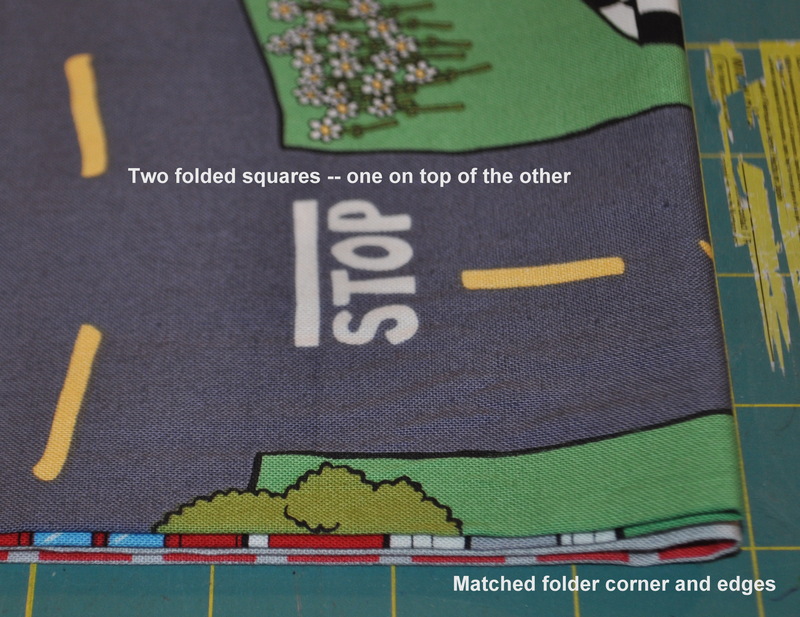 Place one on top of the other, matching the corner fold and lining up the edges. 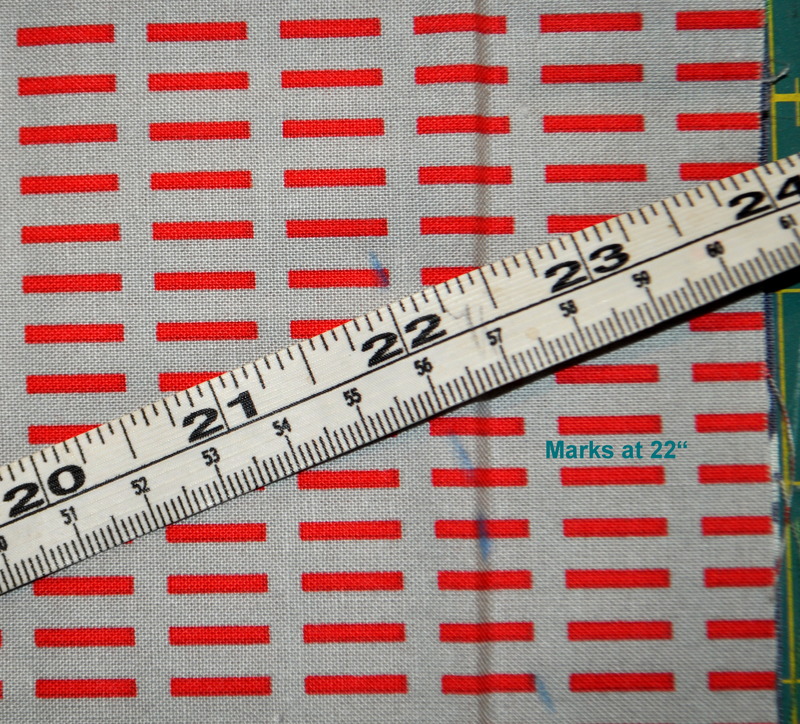 Continue to move the tape measure across the square of fabric, starting at the folded corner each time and making a mark at the 22” point. This will create an arc across your fabric. Once you have cut along the arc you should have two nearly perfect circles that are 44” in diameter. At this point you will need to decide how you want to create the holes on the interior fabric for access to the cording. I used buttonholes for mine, but you could also use extra large eyelets. 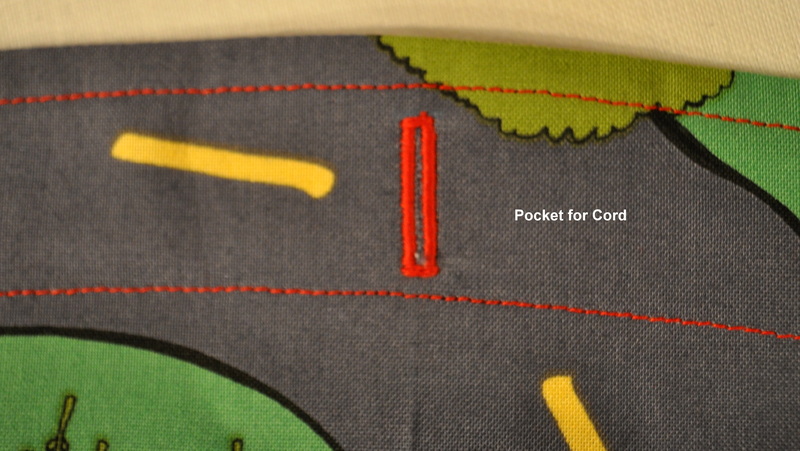 On the interior fabric, place pins marking where you would like to create the buttonholes. I put 4 buttonholes on mine, spaced evenly around the circle. Since the fabric had been folded it had created 4 equaled-distance fold lines. So I used those fold lines as placement for the buttonholes. 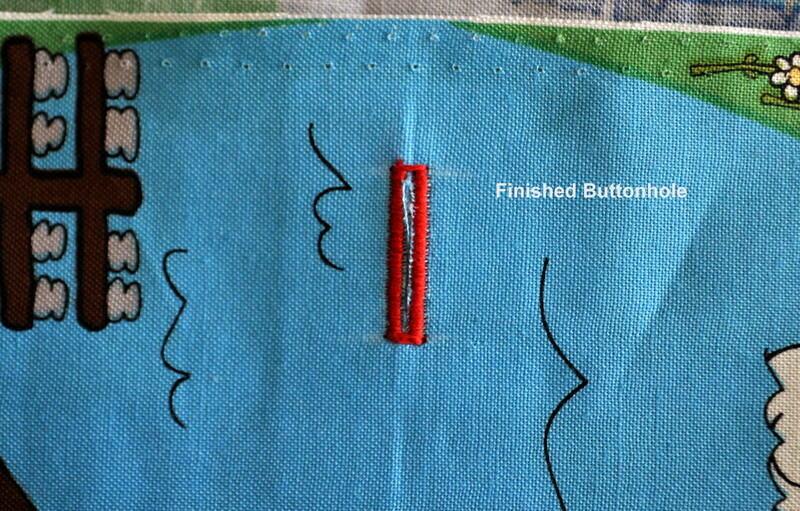 At the placement for the first buttonhole, measure down ¾” from edge and make a mark, and then measure down ¾” from that mark and make another mark. This is where I will create a ¾” buttonhole, with a ½” opening. I used a flat ½” wide cording and it was a tight fit through the buttonholes. 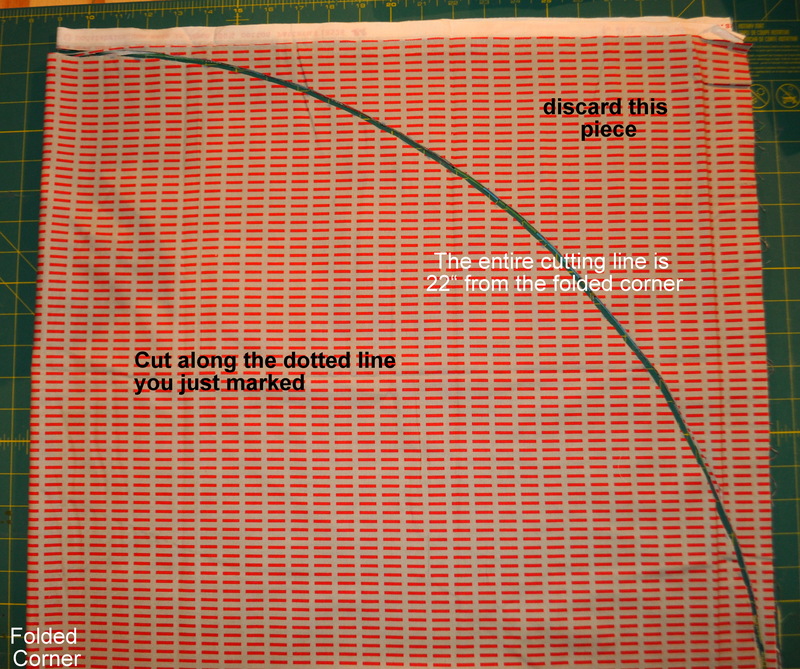 If you have a larger diameter cord, you may want to make a larger buttonhole. Now that I know where the buttonhole will be, I like to stabilize the fabric by ironing some interfacing onto the wrong side of the fabric before actually sewing the buttonhole. I used heavy-duty craft fuse. Since it has a grain, I ironed on one small piece on the back of where the buttonhole will be, and then ironed on another small piece on top of that with the grain going the opposite direction. This will strengthen the buttonhole and provide more stability to this area since this is where the weight of the sack will be held. 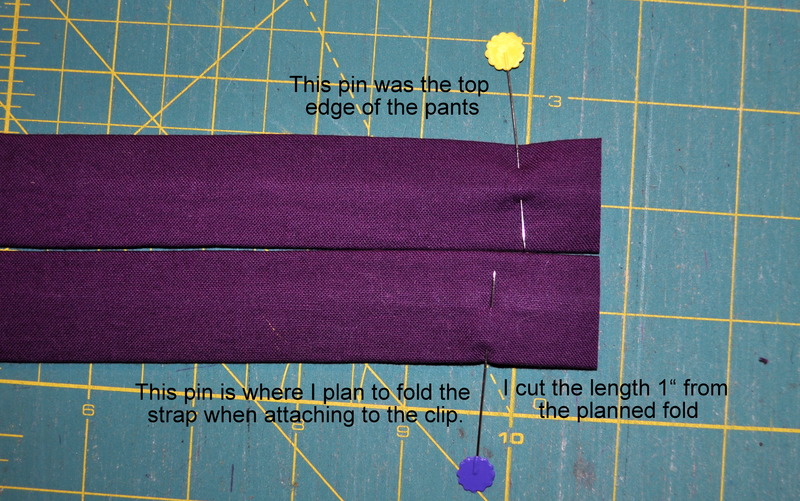 I would also suggest doing this if you were to use large eyelets instead of buttonholes. Do this for all four buttonholes around your circle. And then sew and open each buttonhole. The interior of your bag is now ready. If you wanted to do anything special to the exterior of the bag, now would be the time. I embroidered my grandson’s name onto this one. 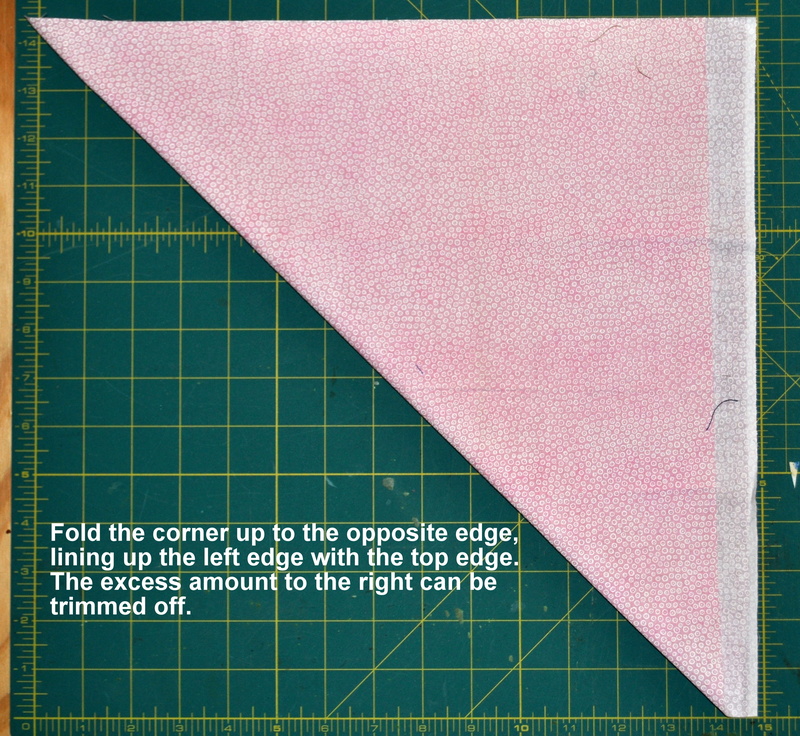 Turn right side out and press seam flat. 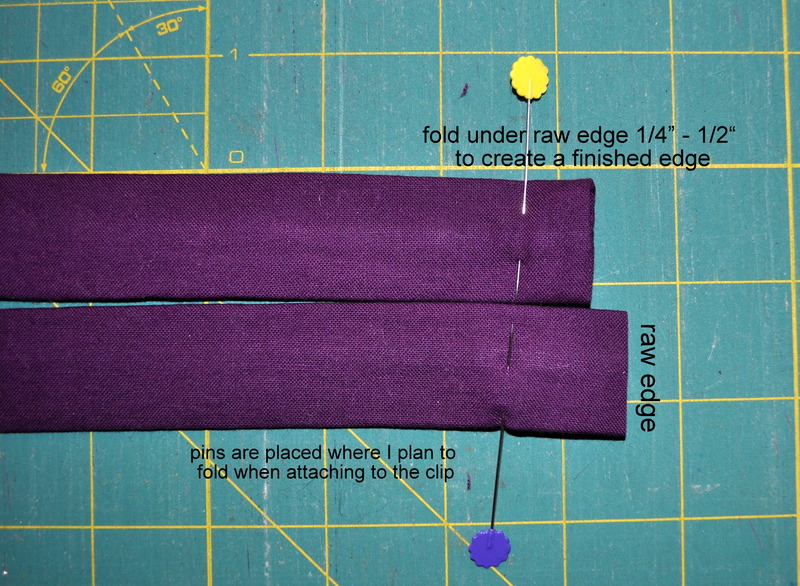 You may need to roll the seam between your fingers before pressing in order to get the seam to the outer most edge. 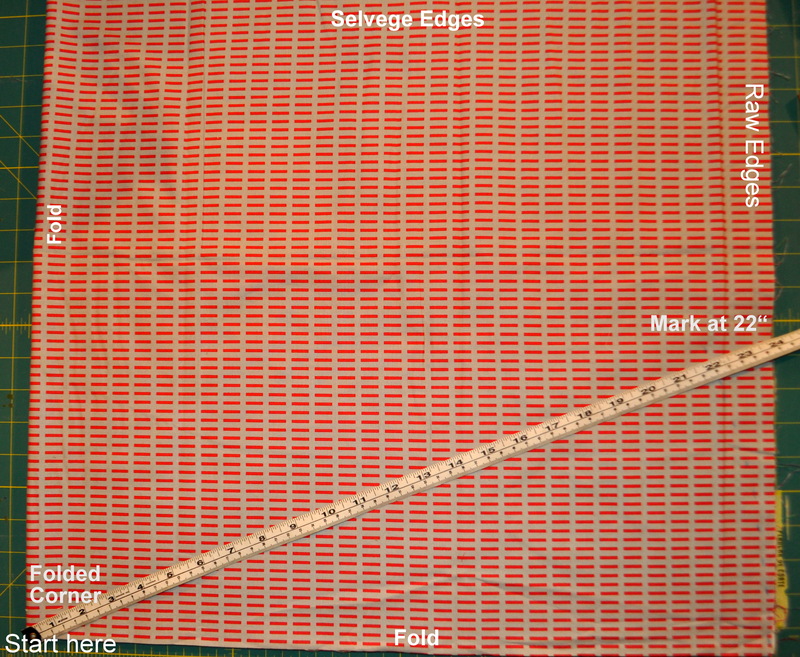 Once the seam has been pressed flat, sew around edge of the sack about ¼” from edge. Then sew around the sack again about 1-¼” from edge. 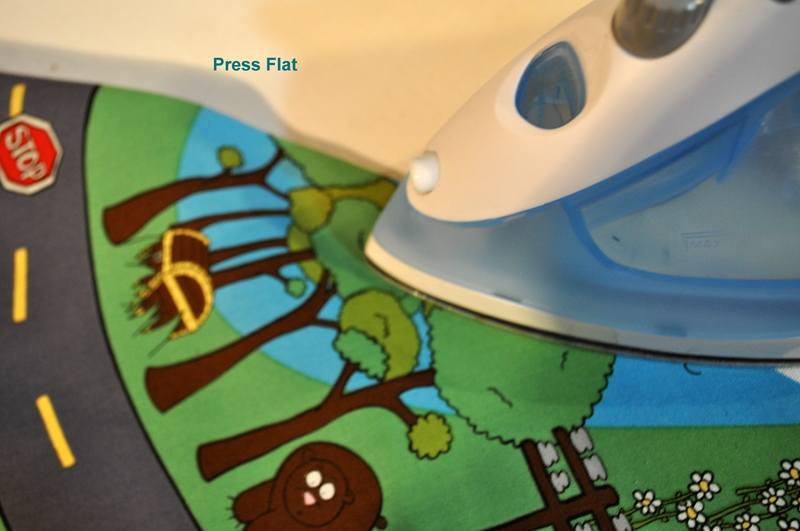 (If you do not have a sewing guide for your machine, you may need to mark this second line all the way around. I know I wouldn’t be able to eyeball that distance with any precision.) 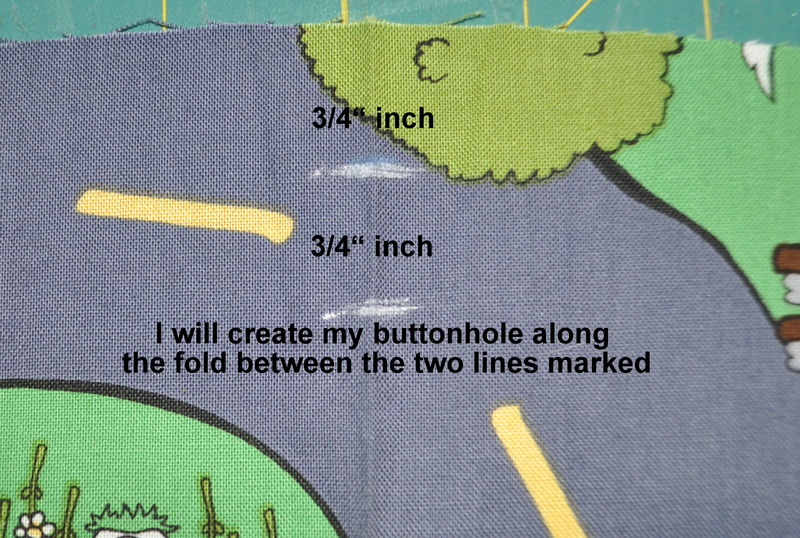 The buttonholes should be between the two lines of sewing you just made. 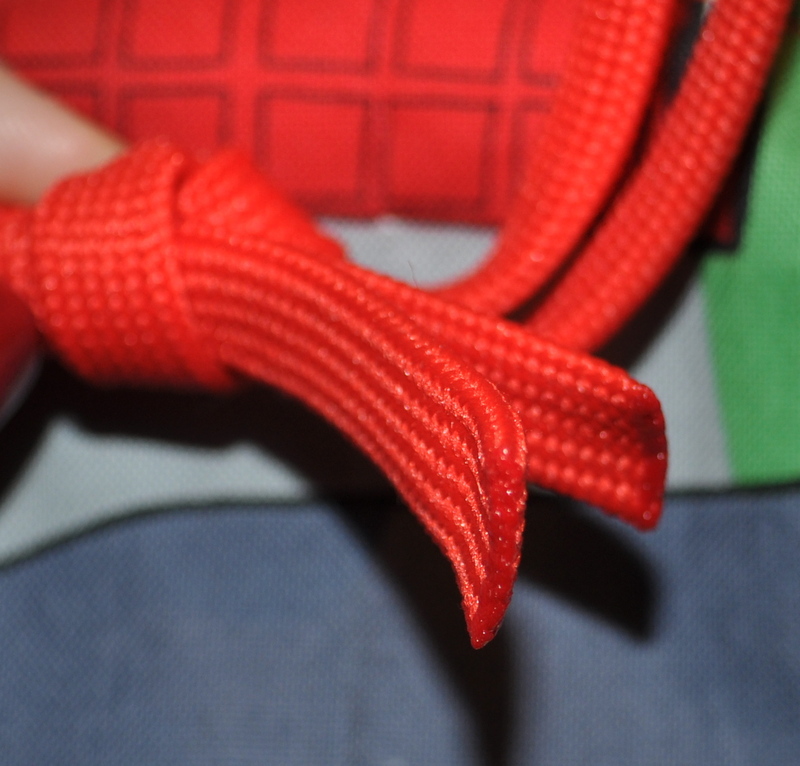 This will create a pocket around the sack for the cord. Thread your cord through the pocket, all the way around until you get to the beginning again. 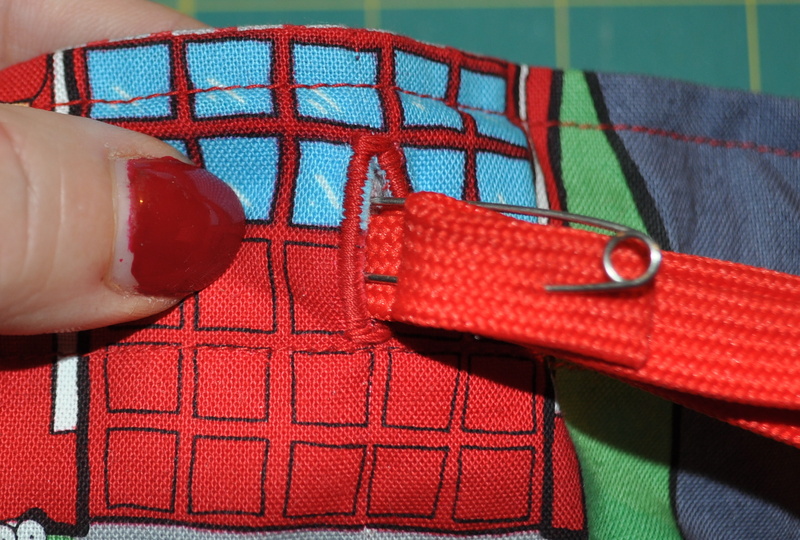 I like to use a safety pin to do this, although you might have your own favorite method. Tie a knot to join the two ends. You may need to burn both ends of the cord so it doesn’t unravel. Pull up a loop of the cord from the buttonhole that is directly opposite that knot, and tie a knot on that side as well. This will give you easy access to pull the cord from each side to close the sack. At the moment, I am leaving the other two buttonholes unused, but you may find it easier to close the sack from all four corners, rather than just 2, especially as it gets full. Congratulations! You have just made a lego sack. 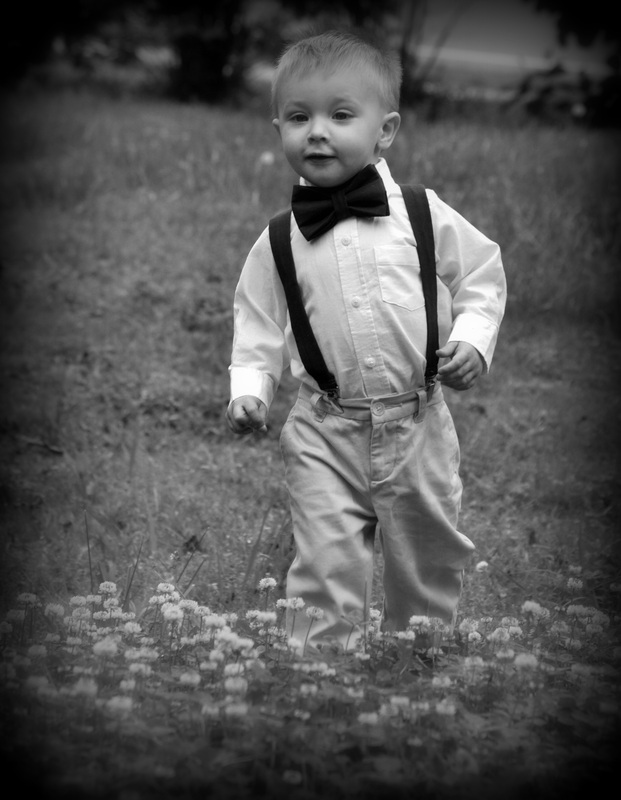 My grandson just turned two. 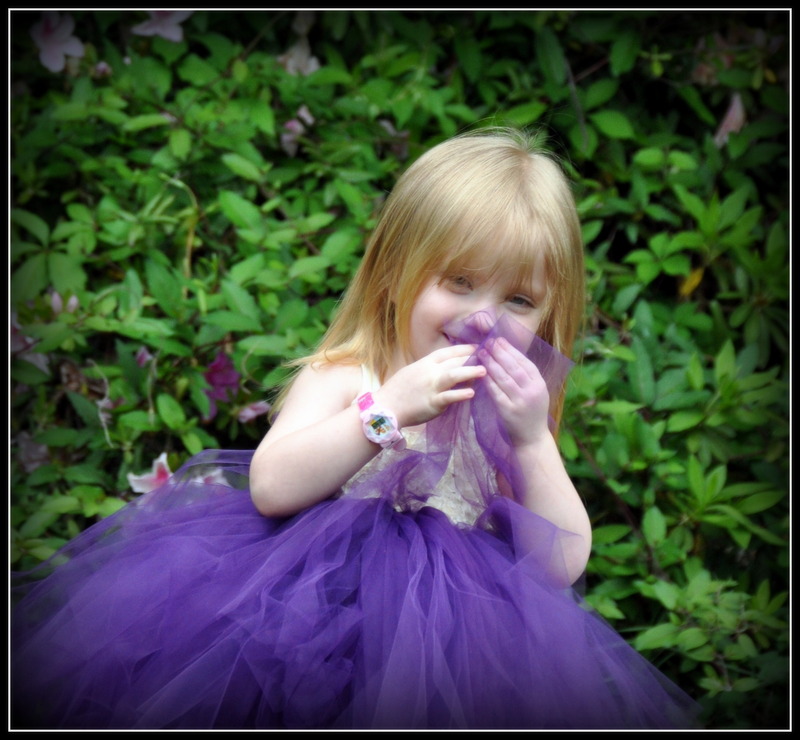 If you are making this for an older child, you may find that you need a larger circle. To do this you would need to either buy 60” wide fabric or sew two widths of fabric together for both the exterior and interior. You would also need a longer length of fabric. However, the instructions for creating the sack would be the same. You start with a square (the length and width of fabric being the same size) and go from there.